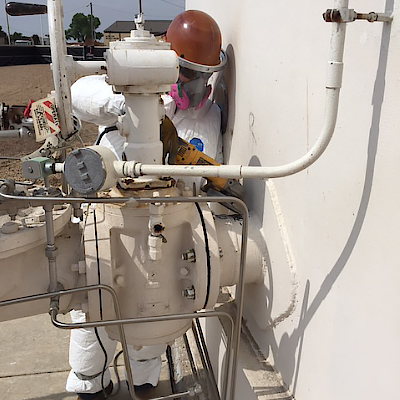 The Multiple Fuel Facility Vessel and Piping Repairs project involves ongoing mechanical repairs at multiple facilities on the Mountain Home Air Force Base. The Goshawk team is self-performing the mechanical piping and equipment repairs concurrently under a stand-alone, sole-source contract. Goshawk's self-performance is adding value for the client by controlling work quality and safety practices and eliminating unnecessary subcontractor mark-ups. The Repair API Tanks Multiple MAJCOM Installations project included the replacement of the annular ring, floating roof and tank chime sealant, High Level Alarm (HLA) repairs, new Automatic Tank Gauge (ATG) stilling well, and multiple minor API 653 and tank containment area repairs. Goshawk’s team self-performed the work under an Air Force Civil Engineer Center (AFCEC) prime contract issued to our teaming partner, Weston Solutions. Proactive planning and submittal processes led to an on-time mobilization to the field and completion of the project ahead of schedule.